Witches, and daemons, and vampires: oh my. The much-ballyhooed second volume of the All Souls Trilogy is here. Fans of the first book, A Discovery of Witches (reviewed by GeekMom), have been waiting for the return of historian and witch, Diana Bishop. Diana violated Otherworld laws by marrying the brilliant and wealthy vampire Matthew Clairmont. The couple faces the ramifications of that choice in Shadow of Night . Fleeing the wrath of witches who are incensed at their union, they head back to 16th-century Oxfordshire. There the time travelers seek a sympathetic witch to tutor Diana who was spellbound by her parents before their death. They also hunt the mysterious book “Ashmole 782,” hoping to find answers to the discord between creatures in the 21st century. While the first book in the series sparked the sort of magic that happens when historical artifacts meet with passionate seekers, the second doesn’t manage to illuminate the past quite as energetically. Diana and Matthew wander through scenes that describe architecture or mention political intrigue but detract from the plot. Historical novels often transcend this “teachy” feeling through the author’s passion for the subject, but in this case that passion occasionally transmutes into the voice of a long-winded tour guide. Instead of absorbing details about alchemy and enchanted manuscripts, the reader is introduced to dozens of notable figures who once lived in the era but don’t come alive on the page. The problem isn’t just too many characters, even the main characters waver in their roles. Those who are said to be dangerously unreliable are suddenly confidants and those who are introduced as important are dropped from the plot for hundreds of pages. The most extreme example is Matthew. Moments of true connection between the couple are beautifully written, but hard to understand from Diana’s perspective when he continues to reveal himself to be a compulsive liar easily provoked to murderous rage. Diana herself engages in violence without a moment’s reflection, hard to imagine when she’s only recently come from the quiet academic life. Readers may ask themselves why anyone would flee the anger of current-day witches to a time when witch hunting was an official pastime. Or why Harkness, a historian herself, allows her character to suffer the pretension that an educated woman of the 21st century could use her knowledge of language and culture to “pass” as an Elizabethan. The narrative thread moves with greater intensity in the second half of the book. We learn more about Matthew’s legacy and Diana’s powers, grasp the significance of Ashmole 782, and see how profoundly the past affects the future. 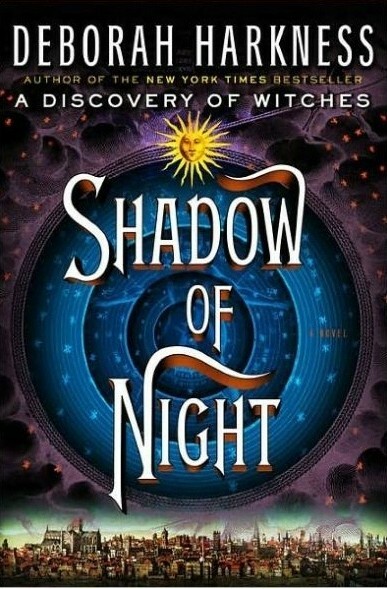 These pages are where Shadow of Night takes on magic of its own. The early, more tiresome pages, are worth the wait. Despite its flaws, the book offers a marvelously complex story with rich undertones that leave a lasting impression. The story may build slowly but reaches a dramatic climax. Unanswered questions will keep readers waiting for the final installment in the All Souls Trilogy.